Motherhood Moment: Book Nook: The Kid's Awesome Activity Book - Games! Puzzles! Mazes! And More! 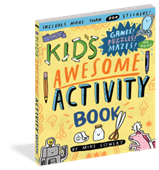 Book Nook: The Kid's Awesome Activity Book - Games! Puzzles! Mazes! And More! I recently had a chance to review Mike Lowery’s THE KID’S AWESOME ACTIVITY BOOK: Games! Puzzles! Mazes! And More! This was a perfect book to get this summer. We have a major road trip planned for August, plus a few camping trips that will have our kids in longer car rides and potential rainy days without all the comforts of home. I haven't let my girls try it yet, because I want it to be new on our first trip, but there is a ton in here. It's going to be great for both my artistic older daughter and my adventurous younger daughter. Writing songs, creating comics, deciphering codes, solving mazes, and doodling are just a few of the activities included. Themes are suitable for boys and girls, with cute leprechauns and animals and adventurous pirates and heroes! If you have a road trip planned for the summer, or just want something new for rainy-day activities, this is a fun book. Mike Lowery is the creator of The Kid’s Awesome Activity Calendar and theDoodle Adventures® series. His latest book, Random Illustrated Facts,collects weird bits of news and knowledge. Mike draws in his sketchbooks and posts on Instagram daily at @mikelowerystudio. He lives with his wife and children in Atlanta, Georgia.